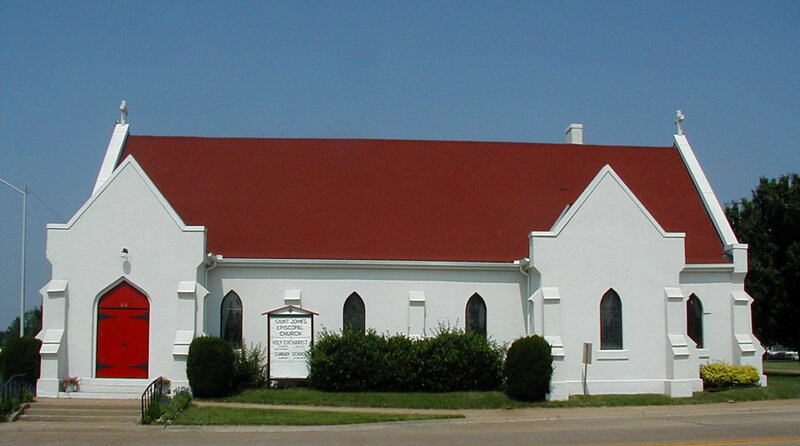 Early church records indicate that while there were Episcopalians engaged in church activity in Parsons in 1872, it was not until 1873 that a church was formally organized. 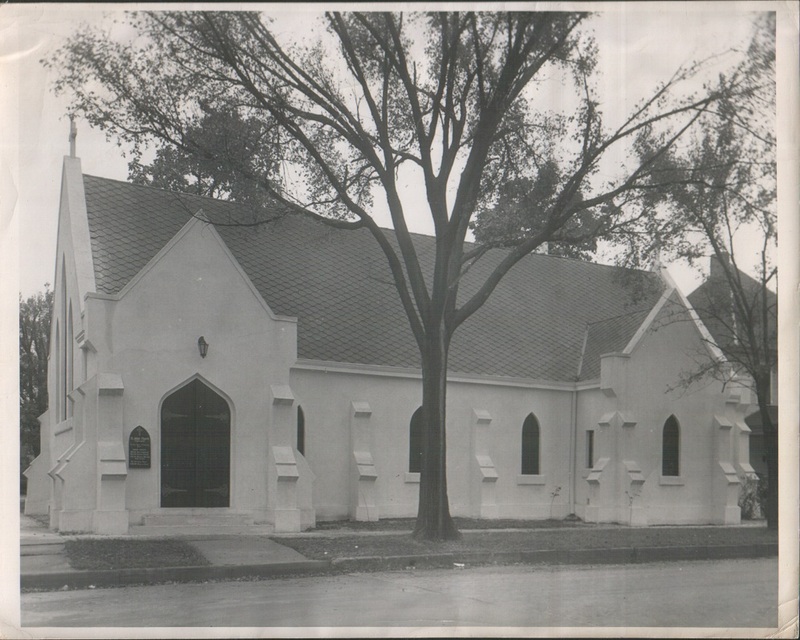 The original name was ‘Grace Church Episcopal Society’. On August 4,1873, a charter was signed by T.R. Warren, Geo. Thornton, Samuel Fletcher, W. H. Adams, Abbie Wheeler, Mary H. Fletcher, Helen L. Noyes and Kate L. Warren. The cornerstone for the red brick with white facings Episcopal Church was laid on September 27, 1874. The church had a gothic roof, windows of frosted glass center with a stained glass border, and was capable of seating 200 people. The construction of the church cost a total of $5,000. A major benefactor was Mrs. Ezra Williams Howard from Providence, Rhode Island who donated $2,000 to the construction of the church in memory of her late husband. Mrs. Howard, a friend of Bishop Vail’s, was born and raised in Rhode Island, and had finacially supported his missionary work in Kansas. On January 26, 1875 a name change was requested. 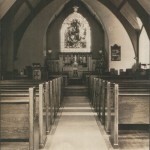 Bishop Vail consecrated the church St. John’s Memorial Protestant Episcopal Society on April 24, 1875. 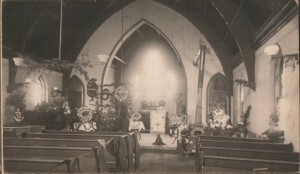 The first Episcopal services were held in the Congregational Church; however, Bishop Vail mentions in one of his journals that he baptized two infants in the parlor of the hotel. We speculate that this was the Matthewson Hotel at that time. In 1895 a reed organ was installed. Another new organ was installed in 1909 – possibly another reed organ. In 1905, a rectory was built, and soon afterwards, consideration was given to building, or rebuilding, to provide a larger church. 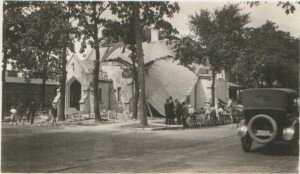 Many people disliked giving up the little brick church, but when its walls were found to be sinking, a decision was reached to build on the old foundations. Construction began on April 24, 1915 and included rebuilding of the walls and foundations. According to an essay of St. John’s history written by Almira S. Cordry in 1935, improvements to the amount of $5000 were planned for and consisted of a thorough update. Included was a roof, a basement dug for the furnace, and the entire exterior covered with concrete and painted white. In addition, a parish hall with a kitchen was erected. 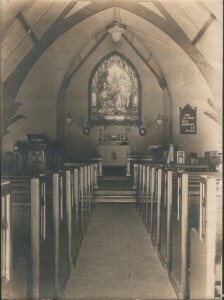 Bishop Millspaugh consecrated it in September of 1915. A year later, in September 1916, tragedy struck. The rector, the Rev. A. E. Hawke, and his family went on a month long vacation in August during which church services were suspended and the building was closed. 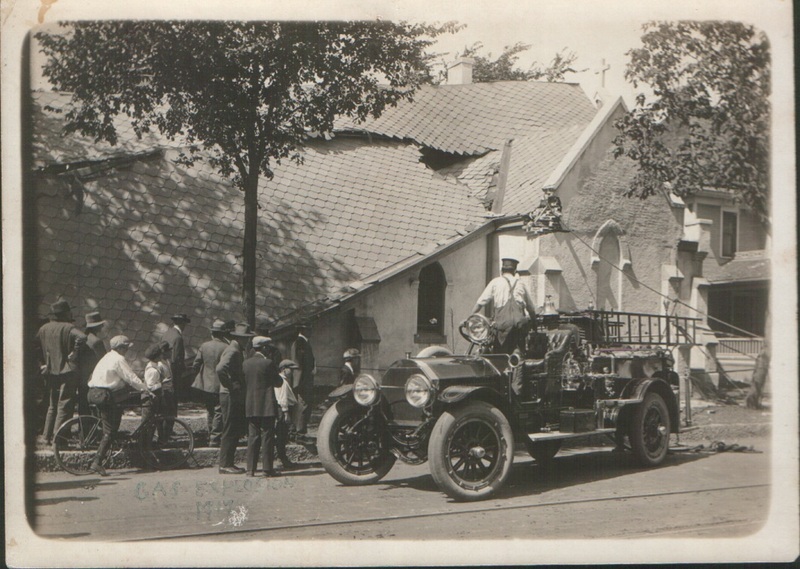 When the church was reopened, Rector Hawke, his two year old daughter, Eleanor, and C. C. Workman, a plumber, were investigating gas fumes in the basement on the last Saturday of September. The plumber’s “electric torch” set off explosions, seriously injuring the three people and leaving the building in shambles. 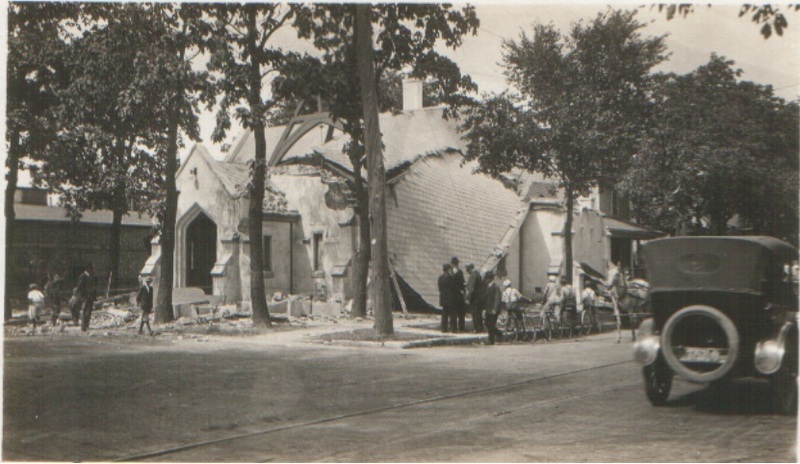 The sanctuary and nave were destroyed, the stain glass windows completely shattered into a mass of powdered glass, the new pews and oak pulpit splintered, and the roof collapsed. Standing in the middle of the ruined church was the alter with the cross and flower vases, both of which remained untouched. Before nightfall the same day, however, the Rotary Club of Parsons, of which Rev. Hawke was a member, had pledged $2000 toward rebuilding. Door-to-door solicitations were gathered and the congregation had responded so generously that a new and larger church building was put up. 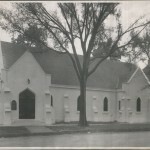 The front entrance was moved to the east on 18th street, the outside walls, roof supports, and salvagable pews were all used. The Matthewson heirs gave another window to replace the one destroyed and memorials were given to replace the other windows with stained glass. At this time the triple window on the south end of the church was donated. 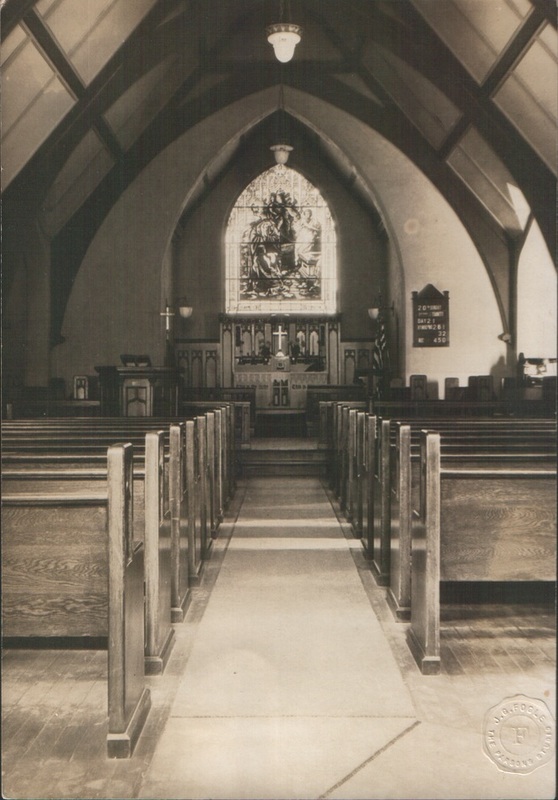 The work on the church was completed in June 1917 and was consecrated by Bishop Wise in the Fall of 1917. In 1922 a pipe organ was installed. In 1949 St. John’s received another facelift to both the inside and outside. The outside was refinished in cement and the inside walls were re-plastered and painted. It was completed on October 16, 1949, in time for the 75th anniversary. The newly renovated church was dedicated to Rev. Loren Lea Stanton (1940-1943). Father Stanton attended school in Parsons and returned in 1940 as a rector at St. John’s. He volunteered as an army chaplain and was called for duty on March 4, 1943. He was serving as Captain with the 7th Army when he was declared missing in action on March 26, 1945. It was later learned that he had drowned when the assault boat he was on capsized crossing the Rhine River in Germany. 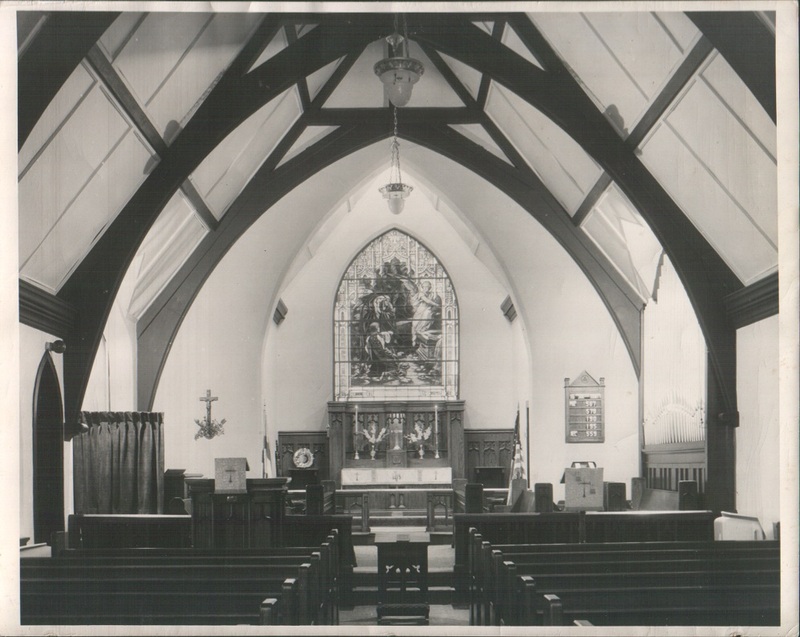 In 1953 the church officially became St. John’s Episcopal Church. An article in the August 15, 1953 Parsons Sun states that the largest amount for a building permit under the new law was taken out by St. John’s Episcopal Church. This permit was for the construction of a new parish house at a cost of $45,000. Ground for the new parish house was donated by W.C. McKee, a “pioneer Parsons Druggist and member of the church”. The 30 by 80 foot building was erected west of the church. Funds for the new parish hall were raised from the church’s congregation, with $18,000 coming from the estate of George and Rachel Fox, former church members who had moved to California. The new parish house was named Fox Hall and dedicated to George Fox who was an active member at the time of the explosion and rebuilding in 1916-1917. On Sunday, October 17, 1954 Bishop Fenner consecrated Fox Hall. The 1st Annual Meeting was held January 18, 1955 in Fox Hall. In 1955, the 10 room rectory, situated directly north of the church was remodeled into a modern home. In 1977 it was razed and landscaping has turned the grounds into a pleasant, well-kept, area for the retirement home northwest of the church. In 1959 the Green-Bowen Room was constructed. This room was built to house the sacristy, choir room, Rector’s study, office rooms and storage cupboards. The entire bill for this was $5,935.15 which was paid from the Green-Bowen bequest and is a memorial to them. Mrs. E. L. Green and Mr. Percy Bowen were children of the 4th Rector, Rev. W. T. (William Turpin) & Martha Bowen. Mrs. Green and Mr. Bowen both passed away in 1956. Their estates had been willed to St. John’s in the total estimated amount of $18,000.00. A thrift store was started in the basement of the parish hall in 1964. It was run by volunteers and served the community. In 1979, the Second Time Around Shop was opened on the Parsons Plaza in a building left to the church by member and former treasurer, Roma Hall. The shop operated in this location for several years, but due to the condition of the building and lack of funds for needed repairs, the building was sold. From 1966 to 1974, St. John’s operated a Day School for children 3, 4, and 5 years old. In 1969, under the leadership of Rev. T. E. Lindemann, the entire membership of St. John’s formed a corporation, Westgate Homes, Inc., to provide low-cost housing for low-income and deprived families. On March 13, 1969 ground was broken and in October 1969; it opened to the first tenants. Early in 1985, Westgate Homes was sold to a private corporation to permit greater flexibility in operation. As an outreach program, St. John’s opened it’s doors to the Alcoholics Anonymous program, allowing them to meet in the church. A third evening was added in the Fall in 1984. In appreciation, August 1, 1986 major renovation once again began outside and inside of the church by the AA group. The outside walls were power washed, re-plastered, painted and sealed, a new roof was also put on and the new red doors were installed. The inside of the walls were also re-plastered and painted. The ceilings were lowered in the choir room and sanctuary. New lighting and carpet were also installed. A permanent wall was built between the choir room and sanctuary. New coping was added and a stainless steel cover was applied over the coping. Another outreach program offered by St John’s is the regular collections of canned goods that are made for the Labette Assistance Center of Parsons. A constant concern to address the needs of the community and of the parish has been a key-note of St. John’s throughout its history; with God’s help, that concern will continue to be its guide as it looks confidently to its future. In the last several years, St. John’s has become handicap accessible, a new bathroom has been added, and the new “old” lights were installed in the nave. The church has also accomplished many things and has participated in several community events. These include first place with the float entry in the Christmas parade, dyed and hidden dozens of Easter eggs, sent children to church camp, supported the Stella Wells Christmas Basket project, Food for Thought at the Labette Community College, and fed volunteer workers at the Community Clinic. New services have been added through our active College Ministry, at least two dozen Dorothy Trieber Memorial Scholarships have been given to high school seniors, our Blessing of the Animals has grown into an animal fair and we have handed out thousands of bottles of “Wholly Water” at several community park events. August 2009 was our 135th anniversary. On August 29, 2009 a Stained Glass Window Tour was presented. In late October 2009 a new roof was installed on the church. In July 2010 the pipe organ was restored and the window from behind the organ pipes was moved to the Green-Bowen Room; which has been known as the Choir/Vestry Room. This window was located behind the organ pipes since 1922 on the east wall. Although it was visible from the outside, we were unable to decipher the memorial. It was discovered that the window was Jesus before Pilate. The Memorial plate on the window reads: “In memory of the sometime Rector, Rev. W. T. Bowen and his wife Martha”. It seems to be fate that the window was agreed to be moved to the Green-Bowen room before the discovery of the memorial plate on the window belonging to Rev. Bowen. September 2010 new seamless gutters were installed. In late 2010 we added a new electric, changeable copy sign facing 18th street. St John’s Episcopal Church has undergone many changes since the cornerstone was laid in 1874, but through them all God has been with us. With God's help we seek to share our love, fellowship, charity and faith, with all in the name of our Lord and Savior Jesus Christ. Sunday School is in recess.